Raised bed gardening – the hoop tunnel is up! I’m a little late with this post…even here in Alberta, I think most gardeners have their veggie seeds in and even most of the transplants planted out – although they may still be holding out on the tomatoes and pepper seedlings outside of the greenhouse. I had promised way back at the end of March to offer up some notes on a lecture I had attended about raised bed gardening and here we are at the end of May and I’m just getting around to it now. While it may be too late to apply some of these ideas this year, there might be a few things on this list to consider for the future! Without further ado (I’ve “ado’d” enough with this one, I think! ), here are a few key ideas about growing veggies in raised beds from Janet Melrose, the garden animator for the Calgary Horticultural Society and facilitator for the Community Garden Resources Network in conjunction with the CHS. 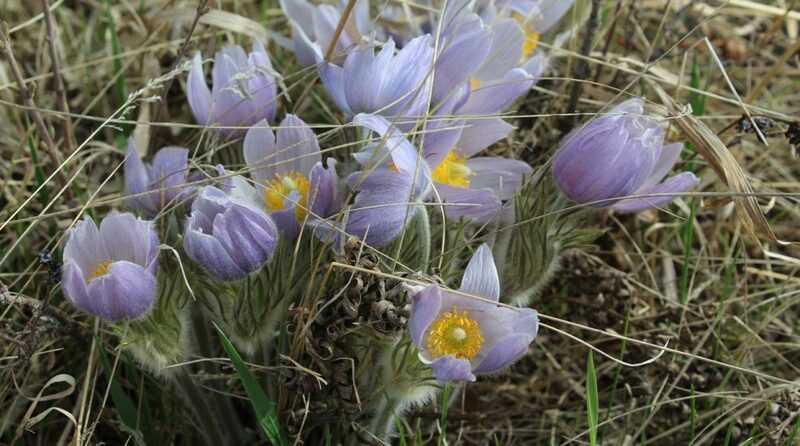 I’m not transcribing the whole lecture – I’d encourage anyone who lives in Calgary and area to attend any of Janet’s talks, as she has a ton of excellent information about gardening in the Chinook zone. *On raised beds versus inground gardening: Raised beds have warmer soil and warmer temperatures at the growing height and are less susceptible to cold traps and early frosts; however, the soil in raised beds is typically drier due to wind and heat exposure, which makes watering an issue. *On combatting dry soil (also weeds!) with mulch: Straw is an excellent mulch in raised veggie beds. Above all, grow crops that you like to eat and can use up! I was laughing about this one because I’ve been guilty in the past of planting crops that I don’t necessarily need – for a couple of years now, I’ve grown beets and while I love them, we get about a gazillion pounds of them from our summer CSA share and by October I don’t really want to see another beet for at least a year. Why on earth have I been growing them as well? This year they were crossed off my planting list! We used hula hoops for the frame (they’re cheap and strong and already circular in shape, plus they come in a wide range of funky colours) – the ones we bought were just stapled together, so once the hardware was removed, they were ready to go. We had some old fibreglass tent poles which we took apart and jammed into the ends of the hula hoops to use as “stakes” to put them into the bed, but you could always do without that step. 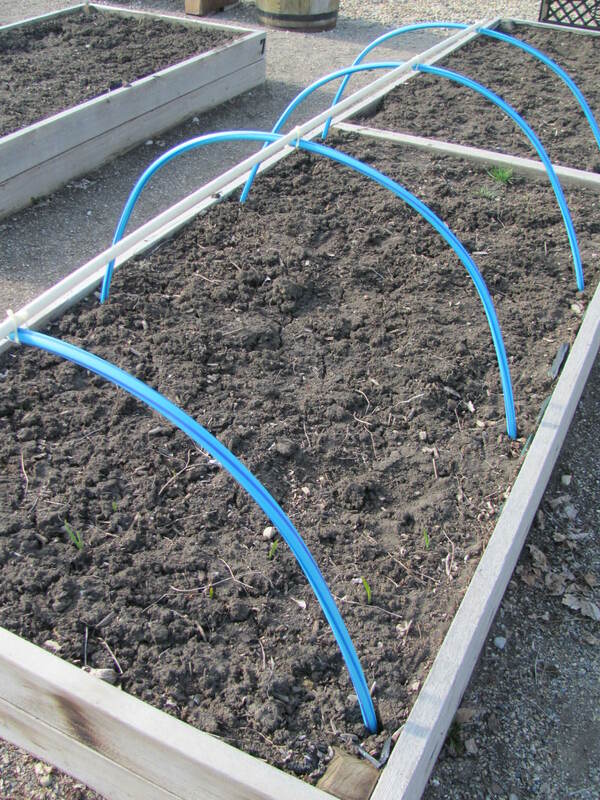 The poles served to give the hoops a lift, offering additional height – not necessary with most of the crops I’m growing but if you’re planting vertically, it may be useful. The upper stabilizer is just a piece of PVC piping (again, very inexpensive), trimmed to fit the eight foot bed and fastened with zip ties. We debated about adding more piping to each end of the tunnel but decided the whole thing was sturdy enough to skip that step – although we may put them in later on if we feel it is necessary. 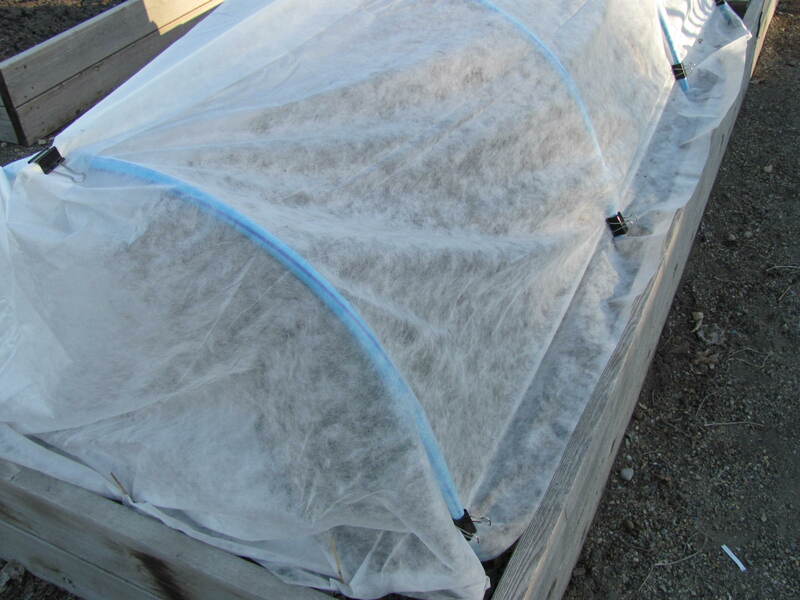 Here it is with the row cover in place…the fabric is water permeable (but hopefully not hail permeable!). I could have used any number of items to hold down the fabric – most gardeners buy pegs specifically for that purpose, but I had some large metal paper clips at home and so I just popped them on. They will rust, of course, but they work very well. Do you grow your veggies in raised beds? What are your tips and tricks for good harvests? Apparently, when my plot-mates and I planted up our community garden plot this spring, we seeded everything a little too thickly…and then we all sort of (in a very “community” way, it seems) forgot to thin any of the young seedlings out. This has resulted in a plot that has fairly exploded with a thick canopy of monstrous white-veined Swiss chard leaves that are protectively shading out masses of tiny, twisted carrots; two tight rows of very coveted tender beets; some crowded nasturtiums which have produced exactly two flowers to date; a handful of robust and densely-packed green bean plants; and a couple of cherry tomato plants that are popping forth oddly-shaped, slightly spotty orange tomatoes. While I’ve been having a wonderful time cooking up as much Swiss chard as I can eat, I’ve also noticed that our poor white onions have suffered in part due to our planting methods. When I was out harvesting a couple of evenings ago, I saw that some of our onion plants had flopped over and turned a sickly yellow; when I yanked them up, they were slimy and covered in tiny slithering white maggots. 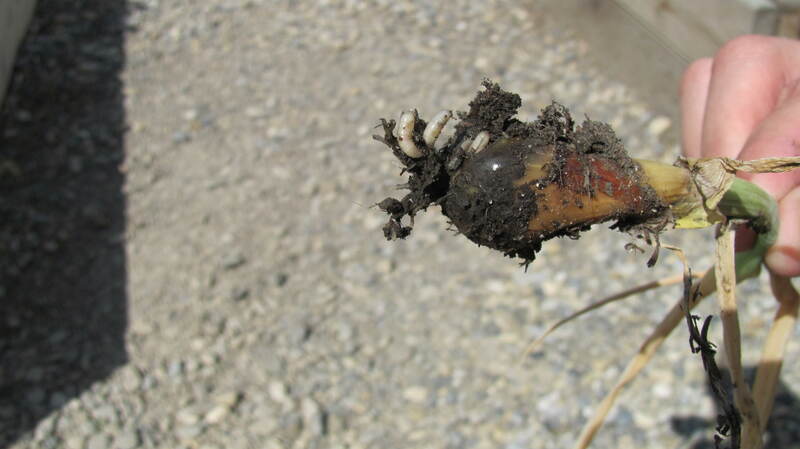 These are the dreaded onion maggots (Delia antiqua, syn. Hylemya antiqua), and they’re ruining our plants because we’ve got them stuffed in the plot so tightly – this, combined with an abundance of rainfall and relatively cool summer temperatures. There’s nothing we can do about them now, except destroy the infected plants – by throwing them in the garbage, not the compost. Lesson learned! Saute vegetables in olive oil until greens are reduced. Add stock and simmer 30 minutes. Remove from heat, cool slightly, and puree with hand blender. Add milk and cheese and reheat gently (do not boil). Add pepper to taste.